They also believed that the dead could be commanded to rise again and spirits or demons compelled to do a wizard’s bidding, through the dark art of necromancy. A surprising number of priests were interested in these dubious practices as a means of gaining power or knowledge. Priests might also seek to exorcise spirits possessing people, by means of prayer or sacred herbs or charms. Vampires, however, do not really make an appearance until the fourteenth century. Why then? In 1348 the Black Death struck Europe. Thousands died and thousands of rotting corpses had to be buried, often in mass graves. Sights of these bodies was often grisly and bloody, and so the idea of the vampire, feeding on the blood of the living, came into force. Recently a body in a medieval Italian mass grave on the Venetian island of Lazzaretto Nuovo was found with a slab of rock slammed between its jaws – a crude anti-vampire measure. The dead woman was suspected by the grave-diggers of being a vampire, possibly because of gruesome sights around her decomposing body when they had re-opened the mass grave to bury more plague victims. So the frightened grave-diggers put a brick in her mouth to stop her chewing through her shroud and escaping the grave to infect others. A very grisly measure! In my forthcoming medieval historical romance, The Snow Bride (due out Dec 27th), I don’t mention medieval vampires but I do deal with witchcraft and necromancers. My heroine, red-haired Elfrida, is a witch and wise-woman and through the ‘magic’ of love she helps my scarred hero Magnus. Both Elfrida and Magnus must battle against an evil necromancer – a medieval wizard who summoned spirits and demons – and, in a desperate race against time, recover Elfrida’s younger sister. 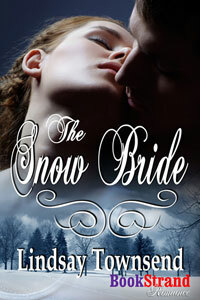 In The Snow Bride I show medieval magic and beliefs, but not medieval vampires. Maybe in another story? Lindsay, congrats on your upcoming release. I love your premise and that is a GORGEOUS cover!